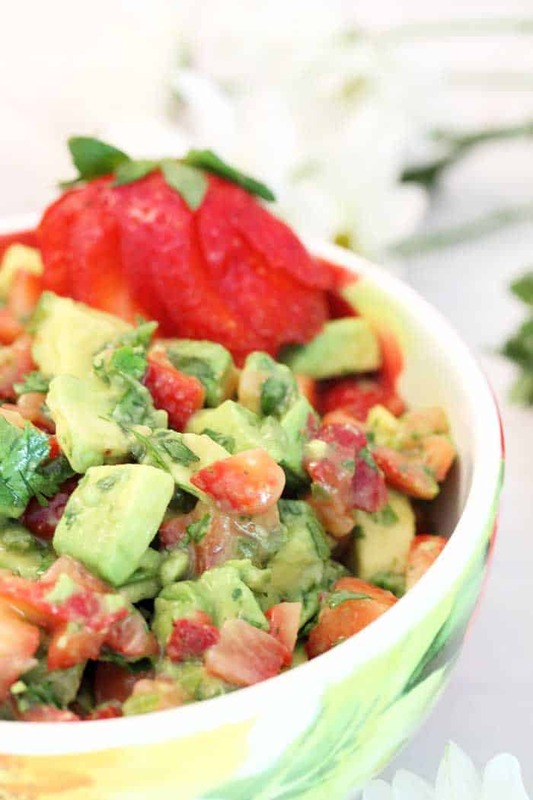 Strawberry Avocado Salsa is a deliciously bright, summery salsa that’s the perfect blend of creamy avocado, sweet strawberries and spicy jalapenos. It takes just 10 minutes and 5 ingredients to make this healthy dip for your next party, picnic or barbecue. Add in sweet Cinnamon Tortilla Chips and it’s so good you won’t want to stop eating it til it’s gone! OMG! 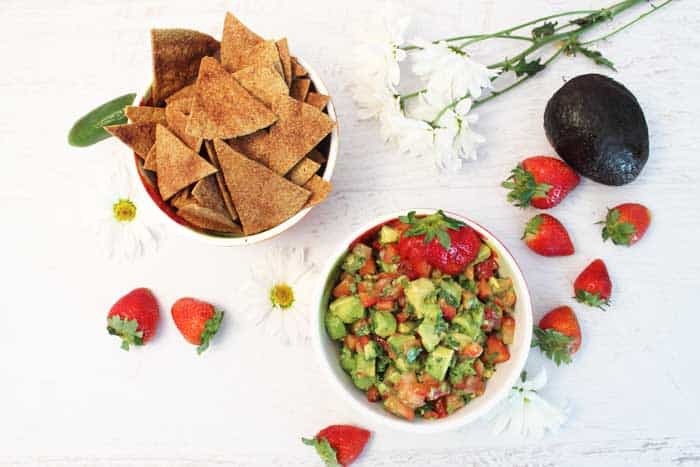 I made this Strawberry Avocado Salsa this past weekend and was practically swooning with delight after each bite. And eating it on our back porch while enjoying the warm sun and cool breeze just made it all the more delicious. I combined mine with some crispy homemade cinnamon tortilla chips made from packaged tortillas, another super simple recipe, and the flavor explosion was incredible! I love my berries and, next to blueberries, strawberries are one of my all time favorites. So when strawberries roll into town with special prices I am not going to pass them up. 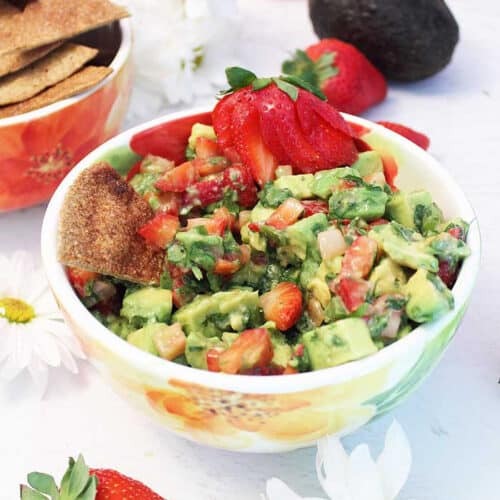 Now I can eat strawberries just as is til they run out my ears (well that’s not a pleasant picture – lol) and I absolutely adore avocados, so pairing them seemed like a match made in heaven. 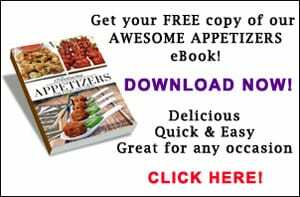 I love making salsas that you can not only use as dips but ones you can use as flavorful toppings for entrees too. 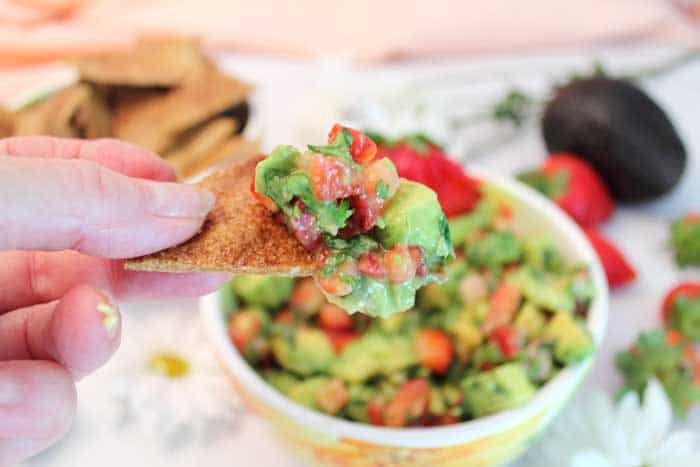 Similar to my Mango Salsa I use for chicken and my Pineapple Salsa I spoon over fish, this Strawberry Avocado Salsa can be a simple appetizer dip or a topping for chicken and fish. 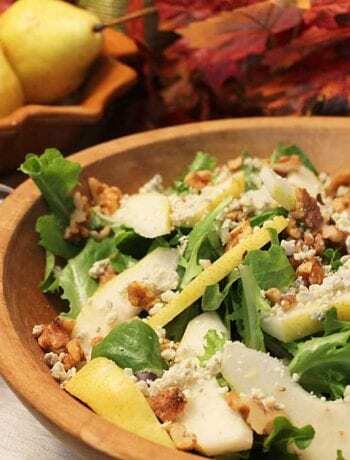 I bet it would even be tasty tossed in a quinoa salad with a bit of feta cheese too. And the best part – it’s soooo easy! 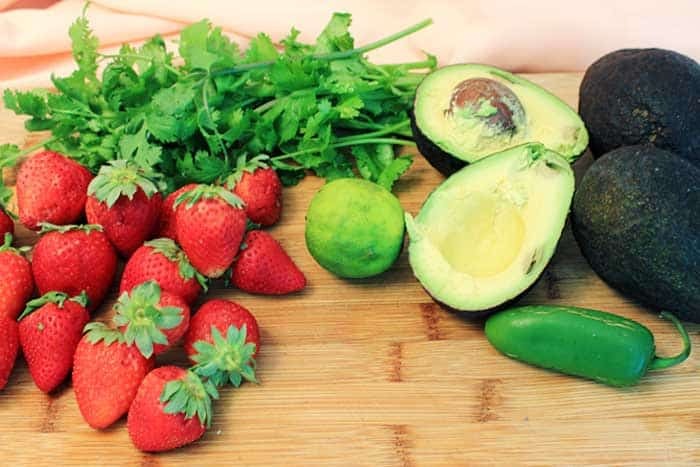 This salsa takes me about 10 minutes and it’s just a matter of chopping the avocados, tomatoes, strawberries, cilantro and jalapeno and tossing them all together with a little lime juice. That’s it! Of course, if you are making the cinnamon tortilla chips too, an additional 20 minutes is all you need, plus they can be made a day ahead and stored in an airtight container, making them the perfect party addition. Believe me, once you taste this deliciously healthy dip you won’t be able to stop eating it! 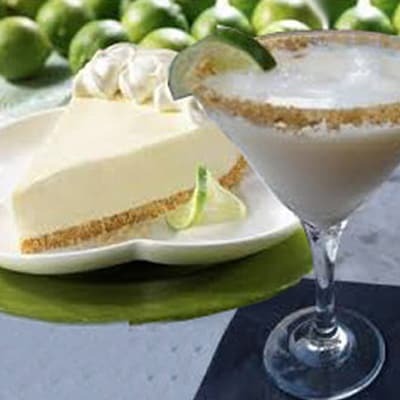 I would advise you to make a double batch because it will be gone before you know it! 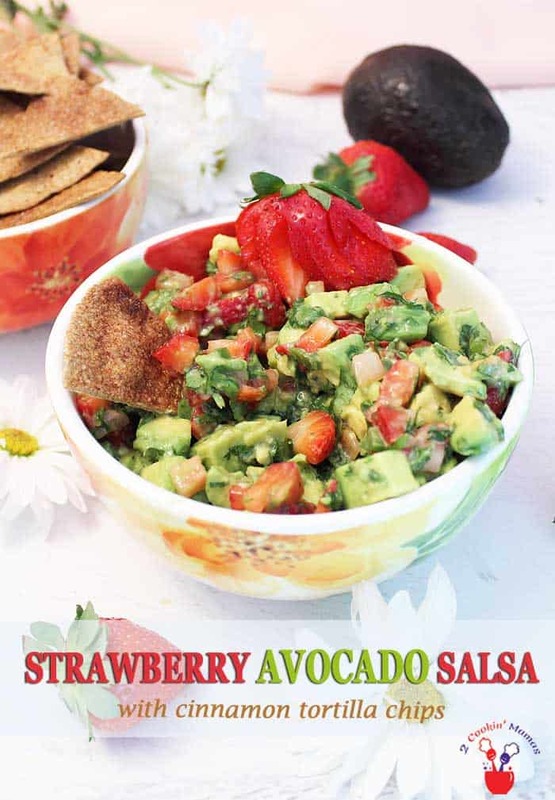 Strawberry Avocado Salsa is a deliciously bright, summery salsa that's the perfect blend of creamy avocado, sweet strawberries and spicy jalapenos. 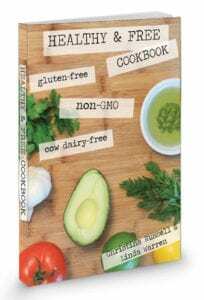 A quick and healthy dip for your next party, picnic or barbecue. 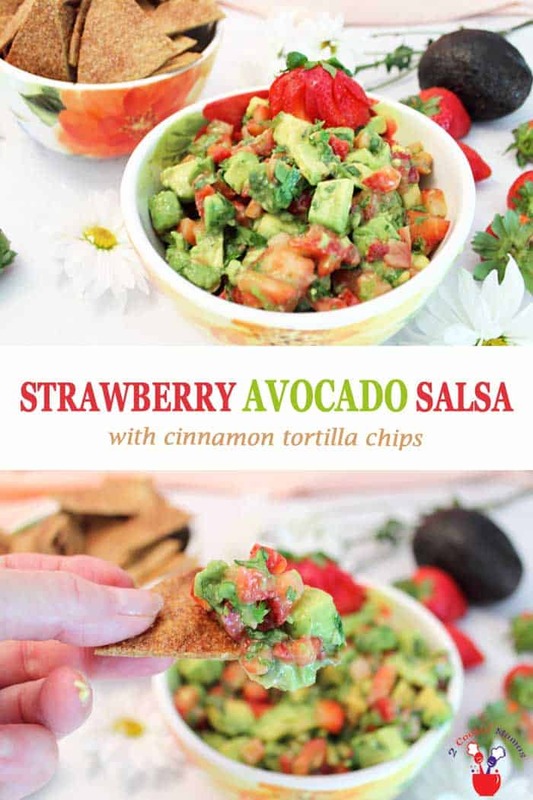 Add in sweet crispy cinnamon tortilla chips to help get that deliciousness to your mouth! 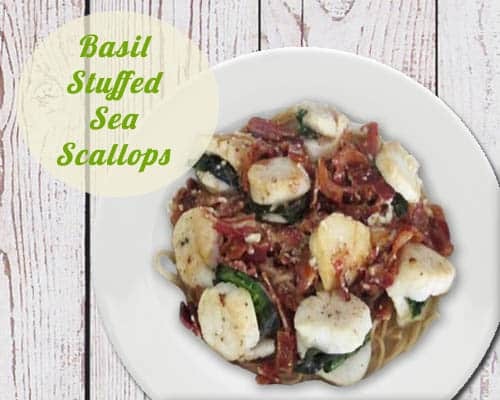 It's so good you won't want to stop eating it til it's gone! Combine all ingredients for salsa in a bowl and toss gently. Brush each tortilla with vegetable oil. Combine sugar and cinnamon together. Sprinkle each tortilla generously with cinnamon sugar mixture. Cut each tortilla into 8 wedges with a pizza cutter or sharp knife. Arrange on cookie sheet(s) in a single layer. Bake in oven for 8-10 minutes or as much as 20 minutes, depending on thickness of tortillas, until crisp. Remove from oven, allow to cool, and store in an airtight container. 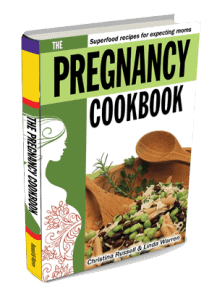 You can also add a tablespoon of chopped fresh mint to the salsa for an added flavor dimension. Yum, this dip was so yummy. And, the tortillas I will be making more often just as a snack, thanks so much for this recipe! Thanks Dana! We’ve been enjoying it on our back porch since the weather has gotten so beautiful. And I know what you mean about the chips – they’re kinda addictive! Love that this comes together so quickly. The cinnamon tortilla chips are a great addition! It really is the perfect dip for spring and summer. Those tortilla chips are dangerously, addictively delicious!